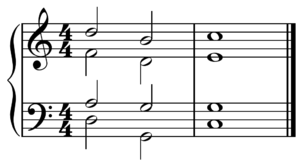 In Wastren muisical theory, a cadence (Latin cadentia, "a fawin") is "a melodic or hermonic confeeguration that creauts a sense o resolution [feenality or pause]". ↑ Don Michael Randel (1999). The Harvard Concise Dictionary of Music and Musicians, p. 105-106. ISBN 0-674-00084-6. This page wis last eeditit on 19 November 2017, at 06:54.